Tuesday, September 8, 2009 ~ 9:00 a.m.
B) Reading and Approval of the Minutes of July 20, 2009 & August 17, 2009. C) Transit Manager’s Operational and Financial Report. 3) Possible Changing Date of October 19th Meeting. 5) Possible Executive Session — Discussion of RTA Bid. Tuesday, September 8, 2009 ~ 5:00 p.m.
A) Discussion of Revisions To the Town Code Regarding Conflict of Interest. A) Approval of Minutes of August 4, 2009 Regular Council Meeting. B) Approval of Minutes of August 17, 2009 Regular Council Meeting. A) Special Event Permit for Vinotok: Community Feast at the Rainbow Park Pavilion on Friday September 18, 2009 and Trial of the Grump/Procession/Bonfire at Elk Avenue/4-Way Stop on Saturday September 19, 2009 (public hearing). B) Resolution No. 11, Series 2009-Adoption of Proposed Weed Management Plan for the Town of Crested Butte (public hearing). C) Ordinance No. 11, Series 2009- An Ordinance Amending Section 13-1-120(a)(3) Of The Crested Butte Municipal Code By Amending The Rates For Water Use Above the “Base Allotment” To $3.00 Per 1,000 Gallons For the Third 5,000 Gallon Block (public hearing). A) Confirmation of Appointment of Glenn Michel as Chair of the Board of Zoning and Architectural Review (BOZAR). B) Ordinance No. 12, Series 2009- An Ordinance Adopting the 2009 Revised Design Guidelines, Town of Crested Butte. C) Ordinance No. 10, Series 2009-An Ordinance Amending the Town’s Code of Conduct Contained in Chapter 2, Article 4 of The Crested Butte Municipal Code. D) Discussion of Irwin Backcountry Guides Request to Allow a Snow Track Vehicle to Operate on a Limited Basis on Certain Roads in the Town of Crested Butte. E) Discussion of 6th Street Station Project Use of Certain Public Property. To discuss the purchase, acquisition, lease, transfer, or sale of real, personal, or other property interest under C.R.S. Section 24-6-402(4)(a). Topic: Spann Property. • Tuesday, September 8, 2009- 6 p.m. Work Session and 7 p.m. Regular Council Meeting. • Monday, September 14, 2009 -5:30 p.m. Planning Commission Public Hearing on Sketch Plan for Proposed Foothills Annexation. • Monday, September 14, 2009-7:30 p.m. Budget Work Session (following public hearing on sketch plan for proposed Foothills Annexation). • Monday, September 21, 2009-5 p.m-7 p.m. Planning Commission Special Meeting. Executive Session and Work Session on the Proposed Foothills Annexation. • Monday, October 5, 2009-8 a.m. Coffee with the Council Location TBA. SHALL THE TOWN OF MT. CRESTED BUTTE, COLORADO, TAXES BE INCREASED $307,000.00 (FIRST FULL FISCAL YEAR DOLLAR INCREASE) ANNUALLY; SUCH TAXES TO CONSIST OF A RATE INCREASE IN THE TOWN SALES TAX OF 1% COMMENCING JANUARY 1, 2010; AND SHALL THE TAX REVENUES THEREFROM AND ALL EARNINGS THEREON BE COLLECTED, RETAINED, AND SPENT WITHOUT LIMITATION OR CONDITION AS A VOTER APPROVED REVENUE CHANGE UNDER ARTICLE X, SECTION 20, OF THE COLORADO CONSTITUTION, OR ANY OTHER LAW? The Town Clerk shall receive written comments for and against the proposal until 5:00 p.m. on Friday, September 18, 2009. Comments may be mailed or delivered to the Mt. Crested Butte Town Hall, PO Box 5800 (911 Gothic Road), Mt. Crested Butte, CO 81225. Those written comments received by the deadline shall then become part of a summary of comments, both for and against the proposal. However, only those comments submitted by persons eligible to vote in the political subdivision must be summarized in the ballot issue notice. To be summarized in the ballot issue notice, the comments shall include a signature and the address where the signor is registered to vote. Copies of the resolution are available for public inspection at the Mt. Crested Butte Town Hall, 911 Gothic Road, Mt. Crested Butte CO during business hours. Dated this 19th day of August, 2009. PROVIDED THAT NO MILL LEVY SHALL BE INCREASED WITHOUT FURTHER VOTER APPROVAL, SHALL THE REVENUES RECEIVED FROM THE TOWN’S EXISTING CAPITAL IMPROVEMENT FUND MILL LEVY OF 5.37 MILLS AND EARNINGS THEREON BE COLLECTED, RETAINED, AND SPENT WITHOUT LIMITATION OR CONDITION AS A VOTER APPROVED REVENUE CHANGE UNDER ARTICLE X, SECTION 20, OF THE COLORADO CONSTITUTION, OR ANY OTHER LAW? Please take notice that a Public Hearing will be held on September 8, 2009 at 7:00 p.m. in the Crested Butte Town Hall located at 507 Maroon Ave. in Crested Butte, Colorado. The purpose of the public hearing will be to receive public comments about a Resolution to adopt the Crested Butte noxious weed plan entitled: Noxious Weed Management: A Proposed Plan for the Town of Crested Butte as a chapter of the Crested Butte Land Use Plan. Information about the proposed weed plan is available at the Crested Butte Planning Department and at www.townofcrestedbutte.com. 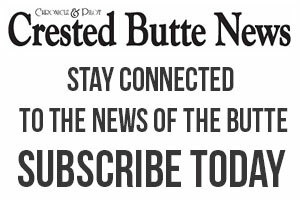 Questions may be directed to the Crested Butte Planning Department or the Crested Butte Town Council when it meets to discuss the proposed Noxious Weed Management: A Proposed Plan for the Town of Crested Butte. By John F. Hess, Director of Planning and Community Development. WITHOUT INCREASING TAXES, SHALL THE EXISTING TOWN OF MT. CRESTED BUTTE, COLORADO, 4% EXCISE TAX ON THE PRICE PAID TO GAIN ADMISSION TO ANY PLACE OR EVENT IN THE TOWN THAT IS OPEN TO THE PUBLIC BE EXTENDED INDEFINITELY FROM ITS EXPIRATION OF MAY 31, 2010; NOT LESS THAN 25 PER CENT OF THE REVENUES OF SUCH TAX TO BE UTILIZED FOR TRANSPORTATION; AND THE REMAINDER OF THE REVENUES FROM SUCH TAX TO BE UTILIZED FOR MARKETING AND EVENT SPONSORSHIP; SHALL ALL REVENUES RECEIVED BY THE TOWN FROM SUCH TAXES AND EARNINGS THEREON BE COLLECTED, RETAINED, AND SPENT WITHOUT LIMITATION OR CONDITION AS A VOTER APPROVED REVENUE CHANGE UNDER ARTICLE X, SECTION 20, OF THE COLORADO CONSTITUTION, OR ANY OTHER LAW? Please take notice that a Public Hearing, conducted by the Crested Butte Planning Commission, will be held on September 14, 2009 beginning at 5:30 p.m. in the Crested Butte Town Hall located at 507 Maroon Ave. in Crested Butte, Colorado. The purpose of the public hearing will be to receive public comments about the Subdivision Sketch Plan for the Foothills at Crested Butte. Approval of the Subdivision Sketch Plan is requested. The land proposed to be annexed to Crested Butte and subdivided is the 44.5 acres located north of Butte Avenue and the Town Shops, east of the Gothic Road (County Road 317) west of the Mt. Crested Butte Recreation Path and mostly south of the Crested Butte Cemetery, however about seven acres is located east of the Cemetery, in the SW 1/4 of Section 35, Township 13 South, Range 86 West of the Sixth Principal Meridian, Gunnison County, Colorado. Information about the proposed Subdivision Sketch Plan is available at the Crested Butte Planning Department and at www.townofcrestedbutte.com. Questions may be directed to the Crested Butte Planning Department or the Crested Butte Planning Commission when it meets to discuss the proposed Subdivision Sketch Plan.